In today's edition of Confessions of a Jaded Beauty Editor, I admit that I've been kind of over trying new products lately. (Please try to stifle your gasps.) After years of fielding dozens upon dozens of products every week and squeezing the overflow into storage bins at Byrdie HQ and my tiny studio apartment, I've frankly dealt with enough clutter for several lifetimes—and furthermore, at this point, I've long since established the staples in my regimen. It's a closed-minded POV to be sure, but sometimes I wonder how there could be products more suited to my beauty routine than the ones I already use. But I still trust word of mouth above all else, especially when it pertains to an under-the-radar gem. 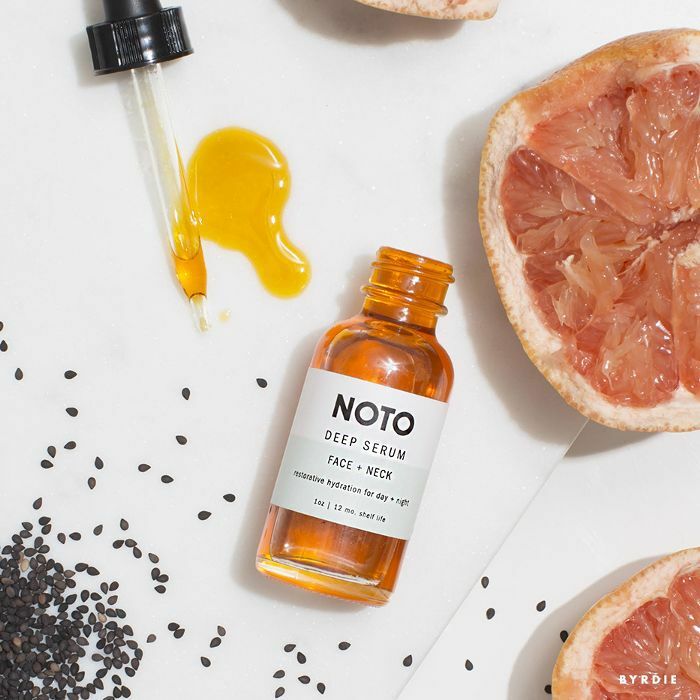 So when a colleague (our impossibly cool producer and photographer, Isabella) insisted that I check out an L.A.-based natural skincare brand called Noto, my curiosity ultimately edged out my growing cynicism. Fast-forward one month, and I'm basking in the (literal) afterglow of my new favorite find: the label's Deep Serum ($28), which has swiftly become my complexion's lifeline this summer. And what a summer it's been thus far: Between traveling across the country (on two separate occasions), a handful of music festivals, and ample time spent outdoors (and out late with my friends), my skin has definitely taken a bit of a beating. Drastic changes in climate and weeks-long sleep deprivation do not a glowing complexion make. That's why in hindsight, the Deep Serum's entrance into my regimen feels like beauty kismet. Not only did it immediately correct the discoloration, breakouts, and flakiness I was experiencing during the tail end of June, but it has also given my skin a noticeable glow even as I continue to chug through my packed summer agenda. That's probably because it's a results-driven cocktail of potent botanical ingredients. Marula oil is rich in fatty acids, which help regulate the skin's moisture barrier—that translates to better moisture retention and cell turnover. Grapefruit and sea buckthorn oils pack a hefty dose of vitamin C, a powerful brightening ingredient. Rosehip oil is an anti-inflammatory. And the most notable addition might be caffeine crystals, which boost the skin's circulation for a firmer, more "awake" appearance. In my opinion, the best skincare products render makeup completely unnecessary but also happen to make it look phenomenal. This serum hits those exact criteria—it gives my foundation a gorgeously dewy finish, but I also don't feel the need to wear any kind of coverage on a daily basis since I started using it. I present the gratuitous selfie above as proof: It's free of any concealer, foundation, highlighter, or filter. Finally, I adore the fact that the smaller bottle of the Deep Serum only sets me back $28 and by my estimate, will last me a total of three months. (You can also purchase the full-sized version for $48). I massage on a few drops of the citrus-scented formula day and night, and for the first time in my life, my skin simply doesn't feel dry… ever.